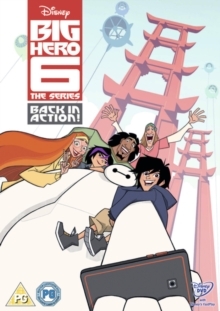 Collection of seven episodes from the animated series which follows the adventures of 14-year-old tech genius Hiro Hamada (voice of Ryan Potter). Accompanied by his trusty robot Baymax (Scott Adsit) and the rest of the superhero team 'Big Hero 6', Hiro does his best to protect his city from a variety of dangerous, hi-tech villains. The episodes are: 'Baymax Returns', 'Issue 188', 'Big Roommates 2', 'Food Fight', 'Muirahara Woods', 'Failure Mode' and 'Fred's Bro-tillion'.